The logarithm of the number b determines the exponent for the construction of the original positive number a, which is the base of the logarithm, and obtain the result of a given number b. The decision of the logarithm is to determine the degree of given numbers. There are some basic rules to define the logarithm conversion or write logarithmic expressions. Applying these rules and determining possible to calculate logarithmic equations, find derivatives, solve integrals and other expressions. 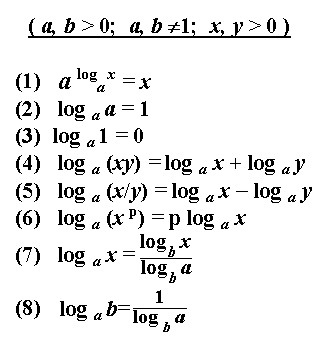 The decision of the logarithm looks a lot like a simplified log entry. Write the given logarithmic expression. If the expression uses the logarithm base 10, the recording is shortened and looks: lg b is the decimal logarithm. If the logarithm is in natural base the number e, then write the expression: ln b is the natural logarithm. It is implied that the result of any logarithm is the power to which it is necessary to build a number of bases, to obtain the number b. Solution of logarithm is calculating the relevant level. Before solving a logarithmic expression, is usually required to simplify the. Convert it using known identities, rules, and properties of the logarithm. Addition and subtraction of logarithms of the numbers b and C on the same grounds is replaced by a single logarithm with a product or division of integers b and C, respectively. Apply as needed the most common transformation, the transition formula of the logarithm to another base. Using expressions to simplify a logarithm, consider the existing restrictions. So the base of the logarithm and can only be a positive number not equal to one. The number b must also be greater than zero. But not always, simplifying the expression, we can calculate the logarithm to its numerical form. Sometimes it doesn't make sense, as a degree represent irrational numbers. In this case, Express the degree numbers written in the form of logarithm.